Rihanna (born Robyn Rihanna Fenty on 20 Feb 1988 in Saint Michael, Barbados), Barbadian singer, is the daughter of Ronald and Monica Fenty. Rihanna's singles include Umbrella, Take a Bow, and Disturbia. 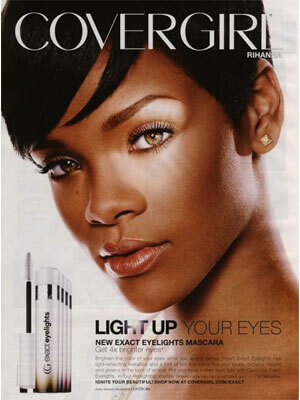 Rihanna signed with CoverGirl in 2007. She has been the face of Totes Umbrella (2007), Got Milk (2008), and Gucci Tattoo Heart Collection (2009) campaigns. Rihanna's celebrity endorsements also include Secret (2005), Nike (2006), JC Penney (2006), Clinique Happy (2006). Her debut celebrity fragrance with Parlux, Reb'l Fleur, launched February 2011.